Fender is back once again with a brand new guitar model that looks absolutely stunning and is sure to catch the eye of any guitar player. The limited edition guitar is called the Mahogany Blacktop Stratocaster, and it seems that the hype is not based on looks alone. Fender‘s new guitar comes complete with three humbucker-style pickups with a metallic gold look that compliments the rest of the guitar’s metal components. While this pickup layout is more traditionally known for its popularity among Gibson guitars, it seems Fender has adopted these mechanics temporarily to give this guitar a little unique-ness. 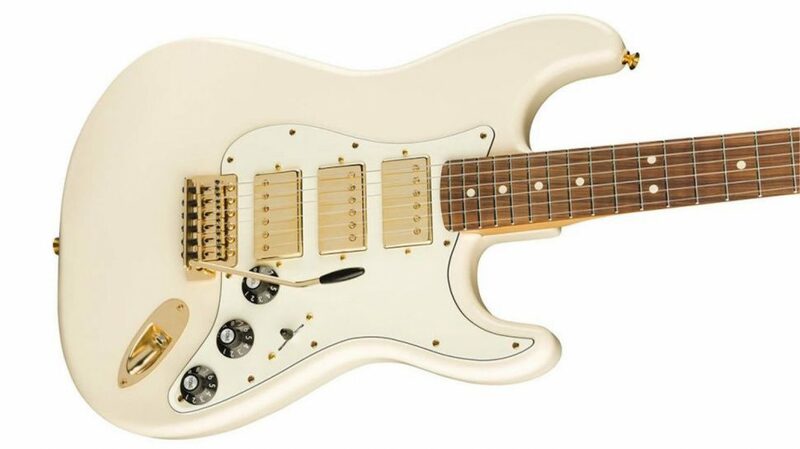 As its namesake suggests, the body of this guitar is made of Mahogany, and sports a creamy off-white finish which compliments the gold pickups very nicely. As far as electronics, the new Mahogany Blacktop Stratocaster comes with two tone knobs, and a volume control knob as well as a five-position pickup switch that’s found very commonly among Stratocasters. The guitar’s pau ferro fretboard has a brown finish, and its head comes in black, which contrasts the rest of the guitar’s color scheme quite nicely as well. The new Blacktop Stratocaster model will be made in Mexico, and comes complete with Alnico humbuckers providing a nice high-output punch which will combine with the mid-range tone of mahogany made guitars to really give players a sound that packs a punch and stands out in any situation. We don’t currently know if or when this guitar will be made available to buyers in the USA, since at the moment it is only available on Fender‘s website to UK buyers. But if you are wanting to check it out for yourself, feel free to follow this link and select your location as in the UK, where you will see the new guitar advertised at £699.00 — which equates to around $915. For a limited edition guitar that looks and likely sounds great, that seems like a pretty decent price.